George Osborne is the most controversial Chancellor of the Exchequer since the Second World War. His austere policies have incited international debate, and his political influence over the government provokes resentment. He is also a survivor with an eye on the premiership. Having authored the most hated Budget of recent times, he now presides over a recovering economy. This is the story of Osborne’s breathless ascent to power: a journey driven by luck, guile, resilience, daring and ferocious ambition. As a back-room adviser, MP and Cabinet member, he has enjoyed a starring role or front-row seat at all the Tory dramas since the fall of Thatcher and the dog days of the Major government, from the party’s long years in opposition to its eventual and incomplete resurrection. Yet rarely have voters known so little about a politician with such sway over their lives and livelihoods. Fully updated to include Osborne’s role in the economic recovery, his appointment of Mark Carney as Governor of the Bank of England, and his prospects as a future Prime Minister, this biography makes sense of a man who is both a personal enigma and a political machine. Based on exhaustive research and access to the innermost parts of the government, it tells the story of George Osborne and the era he has helped to shape. Revealing, penetrating, stylish and superbly written. Honestly, it’s a page-turner. 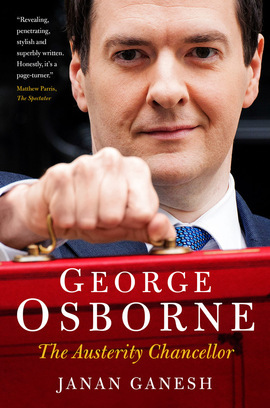 A lively account of the Chancellor’s career … contains a great deal of fascinating new information. There is much of interest in this lucid and well researched biography. For a book about austerity it’s seriously enjoyable.